Larry Williams only recorded for a couple of years at Specialty. From those handful of sessions some of the most influential early rock 'n roll tunes were recorded. Both of these numbers as well as "Bad Boy" were all recorded by The Beatles a few years later. The Stones did their take on "She Said Yeah". The version of "Dizzy Miss Lizzy" here is a continuation of my earlier Guitar Slim post. Once again, chaos reigns supreme at Specialty. This take is vastly different than the version I know from the CD reissue. A studio full of musicians all vying for attention and careening out of control. I love it. It reminds me of Jim Dickinson's production on Big Star's version of "Whole Lotta Shakin' Goin' On". "Slow Down" from an earlier session is a little more refined, although I don't know if that's the right word to describe it. 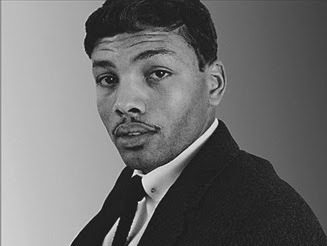 Earl Palmer is on the drums, Rene Hall on guitar, horn section led by Plas Johnson on tenor, and Larry Williams on piano. Williams was cut loose by Specialty a year later after a narcotics conviction. He continued to record into the seventies, until he was found dead from what was ruled a suicide. 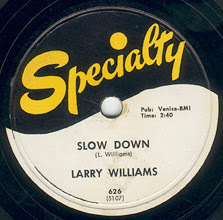 However, those who knew Larry Williams will tell you he was murdered. The likelihood of a left-handed piano player shooting himself in the right temple is slim. 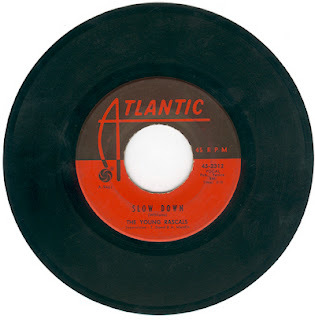 BONUS: Taking their cue from Williams, The Beatles, Booker T. and the MG's, and perhaps The Sonics, The Young Rascals released "Slow Down" as the b-side to their first Atlantic single in 1965.
it is! i forgot about that one. i've got the lp here, maybe i'll try and put it up. a friend of mine turned me on to a version by doug sahm from 1960, that is fantastic, but i only have a locked mp3 that i cannot post. Crow (sixties band from Minneapolis) also did a kickass version of Slow Down. It was the flipside of Cottage Cheese. The band is back together (what sixties band without dead members ISN'T? ), and the song is on YouTube, but they've gotten old.